Yeah in safe mode purge out DDU / afterburner etc. May aswell remove the AMD driver while your there. Go download a previous version (im on 18.12.1). So nothing works. It's a gigabyte aorus x470 mb, antec 750 watt. When I am in safe mode everything works. When I boot windows it freezes at windows loading screen, so I cannot even install adrenalin drivers. I cannot install the drivers in safe mode either, as the driver isn't signed. Sounds like a memory issue. Especially if it's Gigabyte. 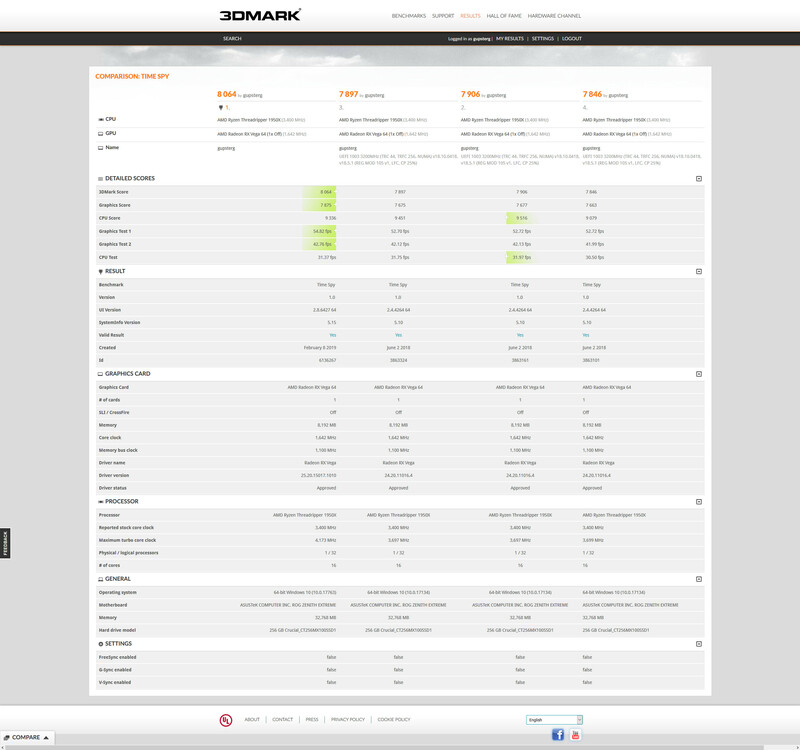 Make sure DOCP is set in UEFI and then lower bandwidth down by one grade (3200 to 2933MHz) for instance. If still freezing remove all but one stick of RAM and all HD's/SSD's except the OS drive and try booting again. Still freezing, reset the UEFI to optimised defaults and try again. Still failing at that point is when you start to test the hardware in other known good motherboards and devices, then test other stuff in that motherboard for a sanity check. Also check for updated UEFI from Gigabyte. Could be a problem already solved in newer BIOS. When I insert my 1060 everything works perfect after installation of Nvidia drivers... No memory issues, windows boots normally, everything works. When I insert the Vega 64 it just will not boot. Under device manager I can see it says RX Vega. Will try some other stuff. It works now! So i think the issue was i didnt unplug my network cable. Apparently Nvidia cars its ok to let the network cable stay in the computer when doing driver installation etc. When i unplugged it windows started normally without any issues. Could install all the Adrenalin drivers etc. After i installed the drivers i plugged in the network cable again, and have worked since! Well it just shows you, I replaced my EVGA SuperNOVA 1600W with a Corsair CP-9020070-UK Professional Platinum Series 1200 and now more crashes!!!! Should have upped yer wattage then, not lowered it! Got to say I've been pleased with my Sapphire Nitro Vega 64 but I'm not sure how it stacks up to others as I've not gone for a maximum clocks attempt yet. 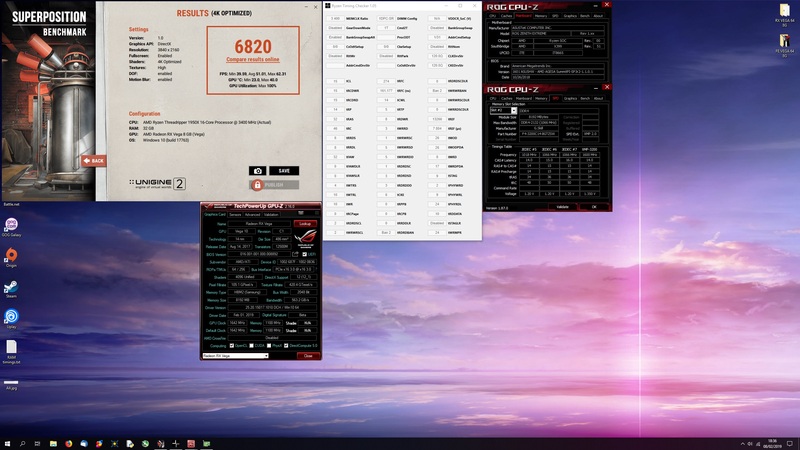 Undervolted and overclocked at 50% power limit got HBM P3 and core P4 to P7 all set at 950mv. Memory is stable at 1020mhz, P7 set at 1582mhz which gives near enough bang on 1500mhz actual clocks all while sipping around 190W. Only disappointment so far is that a custom fan curve in Wattman isn't a curve that ramps up just steps that it jumps up and down between depending on temperature. I also couldn't get zero fan to work with a custom fan profile so ended up sticking with the default profile for the zero fan quietness at idle. 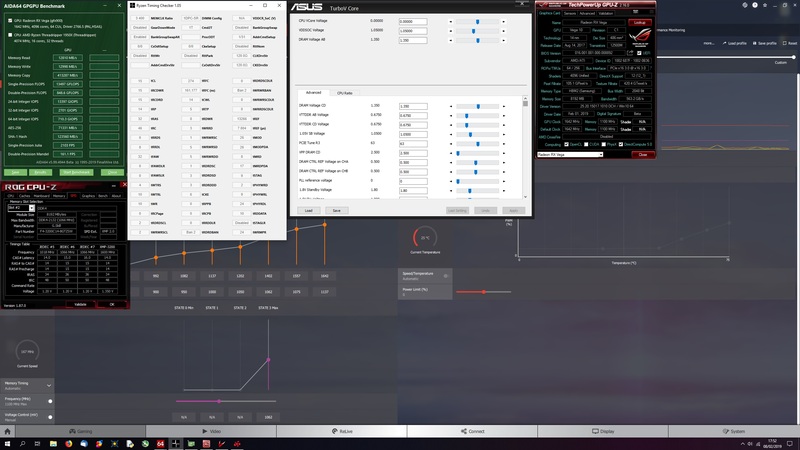 Try the beta version of MSI afterburner as the fan control works. My Sapphire card does around 1600-1630mhz actual in game with a 50mv undervolt and HBM can do 1050mhz but starts artifacting very slightly at 1060mhz and gets worse the higher you go. Like Division 1 D2 Directx 12 is looking the best option. Just started playing about with oc/uv last night. What's a good score to aim for on Superposition 1080p Extreme on a Nitro+ card? If you hit 6800 for 4k optimized you're good to go. Don't have 1080p atm. That looks very similar to my setup, I've got the memory at 1050 and use 980mv and that gives me about 1520Mhz stable in games. I'm also just using the default fan settings in Wattman and for me it normally levels out at about 65C and around 30% fan speed which is still nice and quiet so I'm happy to stick with that rather than push for every last Mhz. I'll try that on mine, as my quiet 1000mv/1672mhz bench's at 1575 but crashed 5 mins into a game. There's also an options page in DDU, if you didn't see it, where you can tick the bottom boxes to reboot in safemode and not allow windows to automatically install drivers. I did that and unplugged my internet cable. Heads up guys, 19.2.1 drivers are borked for me. No matter the settings it's throttling on the Hotspot temps. Really hard throttling too causing loss of FPS in almost anything outside of iRacing for me. Gone back to 18.11.2 for the mean time until a fixed driver set is released. For me latest drivers are going well. Since launch drivers it's been "hit'n'miss" appearance of VRM temps in SW monitoring. So glad it's always there now, gives me more complete data for runs of tests. So far in benches is the same or ever so slightly better performance than past drivers. The OC I set ~1yr 4mths ago is still holding up in games, f@h, bionic, etc. Only thing that has happened is few months back instead of 1125mV for P7 I use 1137V, card was WC'd 2nd day after purchase. I had this problem with my Vega 56. Seems to be an issue with Windows grabbing an ancient (2017) driver from Windows Update after the installer has removed the existing driver. Disabling the network adapter or unplugging the cable prevents Windows from being able to do this. 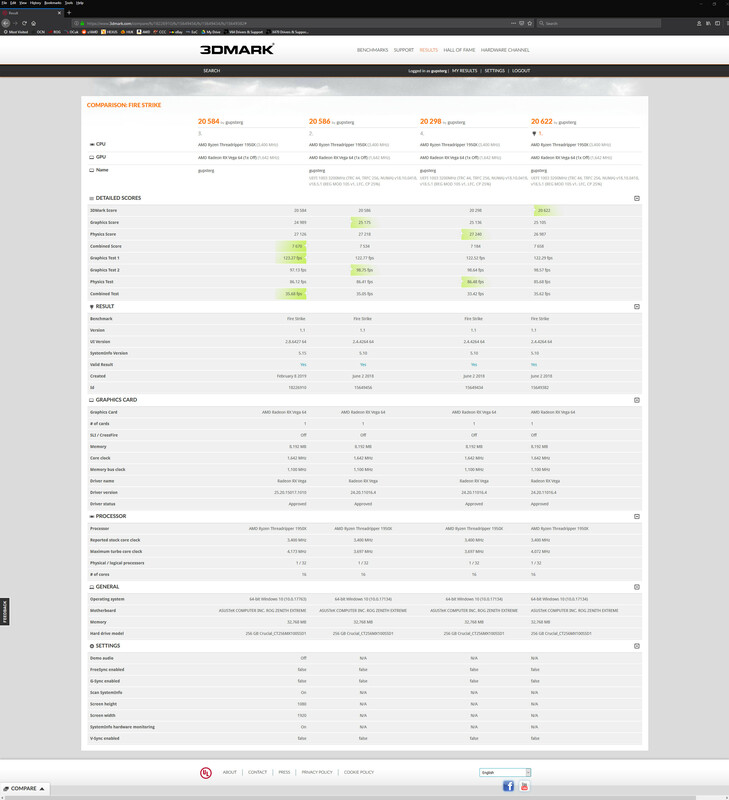 I got 6741 in 4k optimised for my quiet, low power setting, 6976 for my 1702/1150mv P7 faster setting. Mid setting, around 6871 - all 4k optimised. During the Superposition benchmark my clocks tend to level out at the 1640's. How do I fix that? Mine was sitting around 1615mhz gaming. TBH, there wasn't a noticeable difference in FPS at 4k between that and running around 1550mhz, but a lot less power used. Have you tried your memory at 1100mhz/1000mv?